Blow up the oval balloons to the size you want your Easter eggs to be. If you want larger eggs, use larger balloons. If you want smaller eggs use water balloons. In a disposable tin, make your paper mache paste by mixing 2 parts white glue to 1 part water. Mix this well until it is a watery but smooth consistency. Cut or rip strips of newspaper about 4 inches long and 2 inches wide. Dip the strips of newspaper in the glue and stick them to the balloon. Do this in a crisscross pattern, being careful to leave a little space in the opening of the balloon, in other words, don’t cover this part. 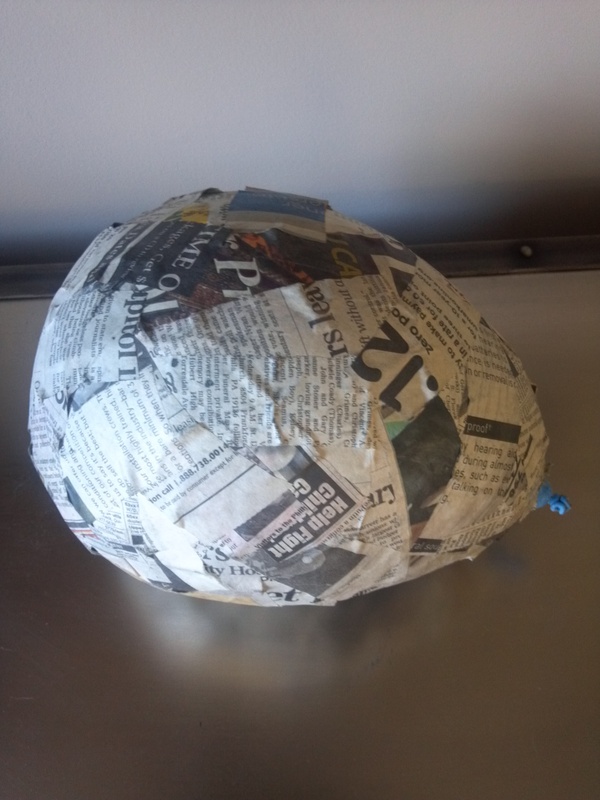 Once you have covered the entire ballon, do another layer of newspaper strips dipped in glue. You will need at least 2 layers, preferably more if you want a more sturdy egg. Let the balloon dry overnight. 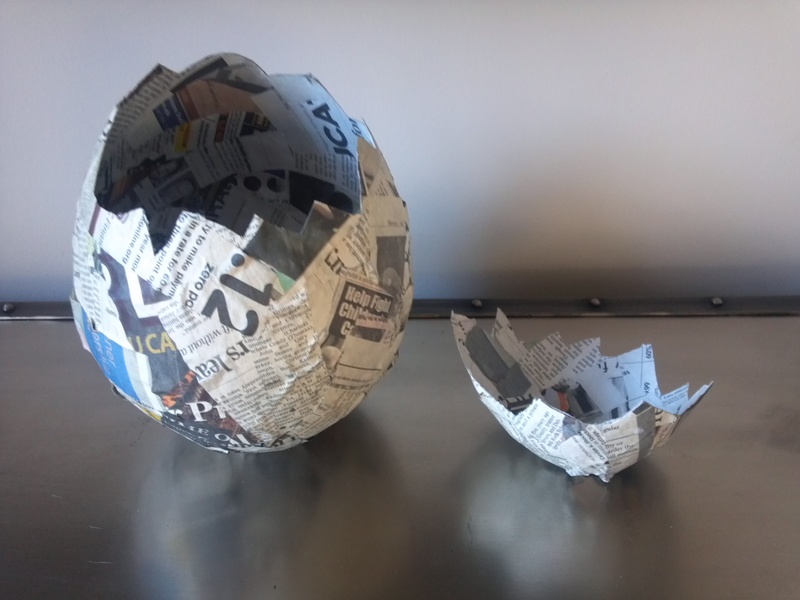 Once its dry, take an xacto knife and cut the balloon knot (opening) and the balloon will pop on the inside of the egg. Believe it or not, the glue ends up not sticking to the balloon! I was surprised when this happened. Then you can cut the egg into the shape you want the opening to be, to fill with potpourri, candy, whatever your heart desires! Then paint the egg the color of your choice, let dry, and fill! I had so much fun on NBC Baltimore with this segment! Since I am an interior designer that LOVES fashion, this is my favorite topic to discuss. Every fall and spring, I love to talk about how you can incorporate the seasons top fashion trends into your home decor in an easy, inexpensive and super stylish way. Some of spring’s top trends on the runways this season are: Geometric Prints, Black and Yellow, Globally Influenced Styles and of course, the color of 2012 – Tangerine Tango! You don’t have to do a complete overhaul of your home decor to give your home that “seasonal twist”. Watch my clip and I will show you how! 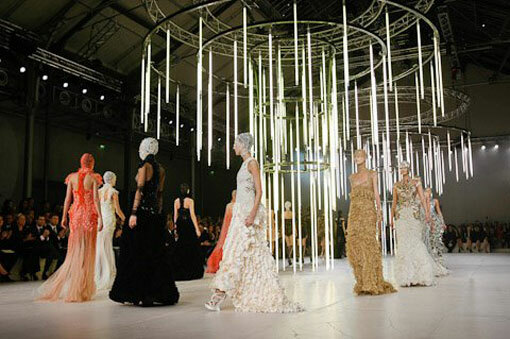 Paris Fashion Week 2011 was another big to-do! Not only were the fashion’s exciting and thrilling, but the runway of Alexander McQueen played an intricate role in enhancing what the models wore. This hanging light fixture was a feature that the models strutted around. The thin, dangling glass pieces emulated the long and lean models that wore the fashions as works of art. The large centerpiece became the focal point of the stage which is not usual in runway shows, the models typically hold the attention. Every opportunity in the design field is a moment to express oneself and try to do what has never been done before. McQueen is no stranger to the extraordinary, and his legend lives on in his masterfully crafted works of art. Semerjian Interiors and Semerjian Builders featured in Main Line Today! Semerjian Interiors and Semerjian Builders featured in the December Issue of Main Line Today featuring “Fabulous Main Line Family Rooms”! Semerjian Interiors partnered up with Semerjian Builders, one of the Main Line’s top luxury custom home builders to create this fabulous family room. The space has a transitional feel, with custom mahogany stained antique beams suspended across the ceiling that unites the beautiful dark hardwood floors for a very balanced and sophisticated look. We paired it up with modern furniture with clean lines and a tastefully neutral color palatte. This look results in an elegant feel that is warm and inviting. 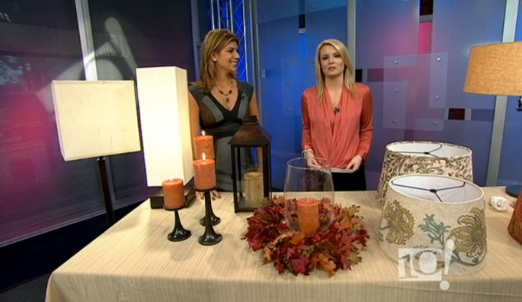 Semerjian Interiors on the NBC 10! show in Philadelphia – Simple and Easy tips to spruce up your home office! Featuring RoomMates Wall Decals. Now that back to school season is officially over, and we have our kids organized and set – it is time for us moms (and dads!) to get our home offices organized and spruced up. Here are 5 great tips to make your office look less officelike and more homey without breaking the piggy bank! 1. Get a great chair! The wonderful thing about utilizing a unique chair for your office is that you can get as wild and crazy as you want because you only need one. 2. Use Non-Traditional Home Items to organize your desk. Think outdoor items, jewelry boxes, etc. They are a great and stylish way to have a dry erase board without having the look of one. I bought a decorative mirror and simply applied the decal to the mirror. Roommates wall decals are 100% removable, repositionable and reusable and can be applied to any smooth surface without causing any damage to the surface or leaving a sticky residue. You can cut them up and use them on binders, cabinet doors, refrigerators and they fully peel off and will cause no damage so you can reuse them and reuse the item! Roommates also has chalkboard decals! As you can see in my video clip, I applied a chalkboard decal to a picture frame and it functions like a full chalkboard. Once you are done with it, you can reuse the chalkboard decal on another surface and you can reuse your frame for pictures! 5. Use a great light fixture. You want to find a light with character. Bringing falls fashion trends into your home is easy to do and can be done with a few pieces. A hot trend this fall is Navajo inspired sweaters. A great way to bring that look into your living space is by using a Navajo woven area rug. You can buy authentic, hand-woven rugs that will not only aesthetically warm up your space, but will add culture and originality to your home. There are endless patterns and colors to choose from and picking the right one to overlay your current floor can be fun and fabulous! So cozy up on your favorite sofa and enjoy the look of your new rug! Check out this amazing set of stairs! 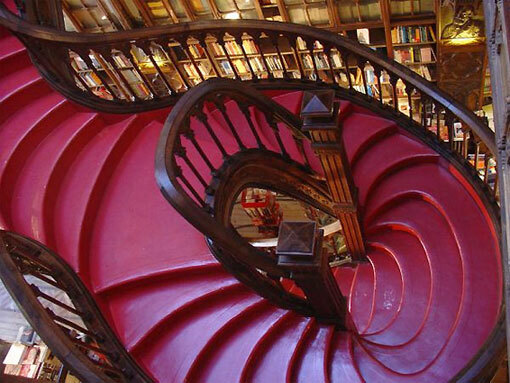 Check out this amazing set of stairs at Lello Bookshop in Portugal. It makes me dizzy just looking at them, I can only imagine how it feels walking them. The way they gracefully wrap the space and make such an impact standing bold in the center of the shop is truly unique design. The smooth, gestural curve that these stairs have descend from above and bring you onto the lower level of the store. The deep red color and dark, beautiful wood create such a rich and lavish combination. Although these do not look like they would pass American codes, they make for great design and give another reason to venture out and see the world and all it’s man made beauty!